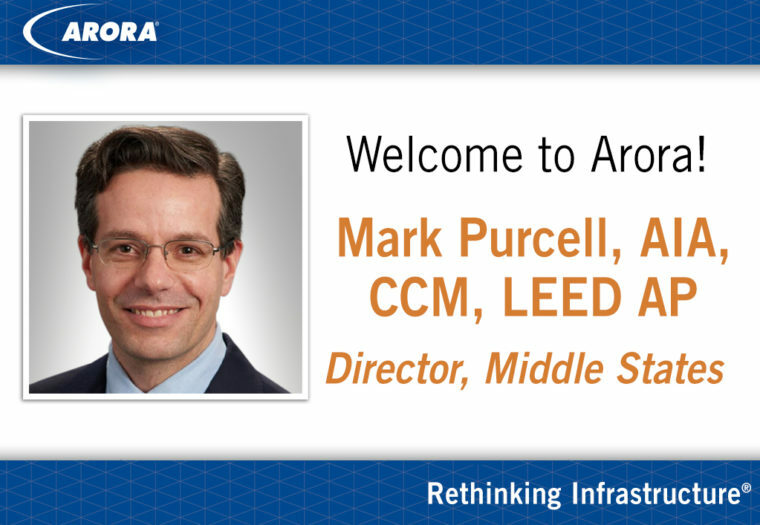 Mark Purcell Joins Arora as Director, Middle States - Arora Engineers, Inc.
Arora is very proud to welcome Mark Purcell, AIA, CCM, LEED AP as the Director of the Middle States region. Mark joins us from Hill International, Inc. and brings over 25 years of experience in the design and construction industry. Mark’s unique background includes working with design firms, government agencies, construction corporations, as well as a real estate developer. He specializes in planning, design, analysis, and construction of multi-million-dollar programs focusing on corporate, institutional, government, healthcare, and education clients. Mark is also an NCARB board-certified architect, registered in several states, and a certified construction manager, recognized by the Construction Management Association of America (CMAA). Over his career, Mark has developed a deep understanding of the particular needs of owners and end-users, as well as the drive to construct more energy efficient and sustainable facilities projects. As a LEED Accredited Professional, he has worked on several LEED Certified projects and is the co-founder and past-president of the Delaware Valley Green Building Council (Green Building United). As an adjunct professor at Thomas Jefferson University’s School of Architecture, Mark has also been featured in numerous publications and is a well-established speaker at industry conferences. Mark’s new role as the Director of the Middle States region includes Pennsylvania, Southern New Jersey, Delaware, West Virginia, Ohio, Indiana, and Michigan. Mark will be responsible for the day-to-day management of our headquarters’ design team in Chadds Ford, Pennsylvania, operational oversight of all regional projects, and coordination with other Arora offices across the United States. We are very excited to welcome Mark and see how his expertise and experience will bring growth and success over the coming years. Welcome to the team, Mark!